Well, instead of using hours to create the perfect blog post i thought i should just post my experiences from my first pre-alpha evidencing of Bagheera. After talking to einar, timo & jørn i decided to jumpstart the project by doing some tests with a simple sms setup (see picture). I created a set of SMS templates that corresponds to objects that would have been tagged with an rfid chip. So by just sending those SMSes whenever i "touched" an object to my Bagheera group (tnx to Silje, Gunnar and Ingrid) i could crudely simulate the user experience of Bagheera. I "tagged" a few objects and places and set out on a trip around campus to photograph some locations. I touched my Dell M70, my Canon D60, the door out of U1, the lunch room, reception and the wood shop, sending SMSes at a blazing speed to my unaware test group (i did not explain what was going to happen). So what did this ad hoc test show? The participants seemed to think it was nice to get a sms from me, but when they started flooding in, pinging all three phones (which where in the same room) at the same time, it became annoying quite rapidly. Loudly announcing something that should just be appearing in the background is not an option. Also the SMS memory of Ingrids temporary phone filled up after 4 messages and wrecked havoc, and that discouraged her from meeting me with her camera when she found out that i was taking pictures in the lunchroom. I asked Silje what she thougth of the system and said it felt like a rebus, but with the sms scenario and me going for it because of the test, it also felt a bit artificial. Gunnar actually enjoyed getting the messages, he felt it had a glancable quality. Gubo also thought that it was nice to get real (realtime?) status updates from me. Other responses was that the name was important to have before the content (ie. knut\camera). Also it should be more objects than just camera and laptop and some places. 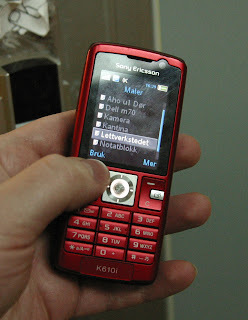 And again sms sound/notification is certainly not the way to go with frequent messages. Someone questioned who is seeing all the messages, "is it just me?" My own thoughts is that it will become an issue with which things gets tags and what does not. Does places get tags? Places need to have longer descriptions to add the context (eg. AHO/U1/Door/Exit). An object like my camera already got its context from belonging to me (eg. Knut/Camera). 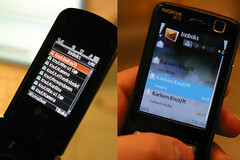 Also the huge difference in the display of SMS messages in short on the phones where striking (see picture). Eight clearly readable lines on the LG KG810 versus four hard to get tiny lines on the Nokia N73 (why all the wasted space?). White on black is clearly more readable in this situation. That is all good experiences for me to bring to my own Bagheera interface.